Subterranean termites are the most destructive insect pest of wood in the United States and cause billions of dollars in damage each year. Unfortunately, most home and business owners never know they have a termite problem until it is too late. That is because a majority of subterranean termite activity is hidden inside walls and covered areas where we can’t see. In this article, we have good news for you. You’ll learn about subterranean termites, how to have your home effectively treated and how you can take care of your home so you may never have to deal with them again! Subterranean termites could be living under your home in Orange County. There are a number of different species of subterranean termites in the U.S. In California, the “western subterranean” termite is the one we have to deal with most. The primary winged reproductive males and females have wings. Other reproductive members of the colony have no wings and are white to cream-colored. The winged primary reproductives (also known as alates or swarmers) are the ones most people are likely to see. Their bodies are almost black, about ¼ inch long and they have two pairs of equal length wings which are almost twice as long as their body. None of the reproductives eat wood – their job is to make a lot of babies. The workers are wingless, white to creamy-white and are about ¼ inch long. Worker termites are the ones that do all of the damage to wood. Soldier termites look similar to the workers in color and general appearance, but you’ll find they have a well-developed brownish head with a pair of strong jaws. When the conditions are right, the young kings and queens burst out of their nest and begin their short flight. They are very poor fliers and often follow the prevailing breeze. They break off their wings while still in flight and spiral down to the earth or sometimes they land and then remove their wings. Kings and queens are not attracted to one another until the wings have been clipped off. They have a very high mortality rate and only about 3% survive. Once a king finds a queen to pair off with, he follows her around until she finds a place to call home. Perhaps they will do this by excavating a small cell in moist ground, under wood. About a week later, they will mate and the male will stay with her for the rest of his life. The queen may survive up to 25 years and lay as many as 60,000 eggs. Subterranean termite colonies are large in numbers and may consist of many thousands of members. It is very important for you to know that there may be a dozen or more termite colonies surrounding a single structure at any given time. In other words, doing a treatment in one area may kill off one termite colony but there may be a dozen or more colonies still working in other parts of the structure. This is why full-perimeter treatments of the entire structure are strongly recommended. Careful Inspection And Treatment Is Key! Have your home carefully inspected on an annual basis. 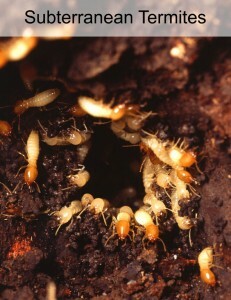 Inspection is especially important when dealing with subterranean termites because they can be so difficult to locate. If an infestation is found, you need to take care of it quickly. We strongly recommend using a non-repellant termiticide, such as Termidor. Unlike “cheap and smelly repellent products,” Termidor is virtually odorless and the termites will never know it is even there. Termidor is especially effective because it offers the “transfer effect”. In other words, when a termite is exposed to the product, the termite will return to the colony and spread it around to other members. This is how we can now eliminate entire colonies. Another product we recommend is named Altriset. The EPA considers this product to be eco-exempt, or minimal risk, because it has no known side effects on humans or domestic animals. Altriset is non-repellant and also offers the transfer effect to other members of the colony. In new construction of homes or buildings, use termite shields on foundations, piers and between wooden steps or porches and the main structure to prevent termite access from the soil.We strongly recommend that soil treatments be performed prior to pouring of the foundation to prevent subterranean termites.Treatment of new wood members with borate solutions can also be very effective. Eliminate wood contact with the ground (e.g. by replacing wooden posts and piers with concrete ones and by supporting wooden steps on a concrete base at least 6 inches above the ground). Regrade soil around the perimeter to ensure drainage away from the building and maintain at least 6 inches clearance between wood siding or shingles and the ground. Ensure there is at least 18 inches clearance in crawl spaces between all horizontal timbers and the ground. Reduce humidity in crawl spaces by ensuring adequate cross-ventilation. Covering the ground with a plastic moisture barrier will reduce humidity under buildings by reducing evaporation from the soil. Remove any wooden debris which might become a source of infestation beneath the building, including scrap wood, form boards, old tree roots, and even sawdust. Fill any crevices or voids where they might help subterranean termites move from the ground to wood in buildings, including foundation cracks, hollow blocks, gaps between stucco and the wall and crevices around pipework. Remove infested stumps and trees near buildings. Eliminate sources of excess moisture such as plumbing and roof leaks. Make sure sprinklers are adjusted and stay away from the house. Have your home inspected on an annual basis and if a problem is spotted, take care of it quickly. Have a termite problem and need an inspection? Call our office at (949) 631-7348 and we will schedule an appointment at your convenience.